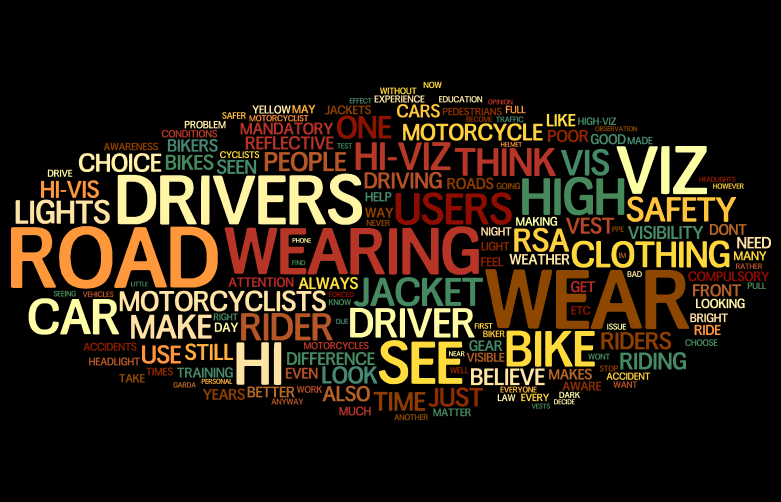 MAG Ireland’s high viz survey has drawn a fantastic response. We are truly grateful to everyone who took part and in so doing helped to shine a light on this contentious issue. We were particularly impressed with the number and quality of the comments left by those who took part. At the time of writing, there are just under 400 comments all told out of just over 800 responses in total. We are really looking forward to seeing the final results. Initial analysis has shown some interesting trends and suggests that voluntary high viz usage is between 50% and 80% depending on the circumstances. Not surprisingly, the highest wearing rates are in darkness. 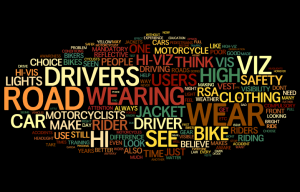 A word cloud of the text in the comments - click to enlarge. It is a cultural thing,in as many ways that a head dress is symbolic to a religion then the wearing of black patches cut offs etc are our lifestyle choice and is a reflection on our way of life and belief system. The imposition of any form of compulsory clothing segregates a group in a community and and removes freedom of expression and with the Christian Motorcycle impinges on their right to express their faith.